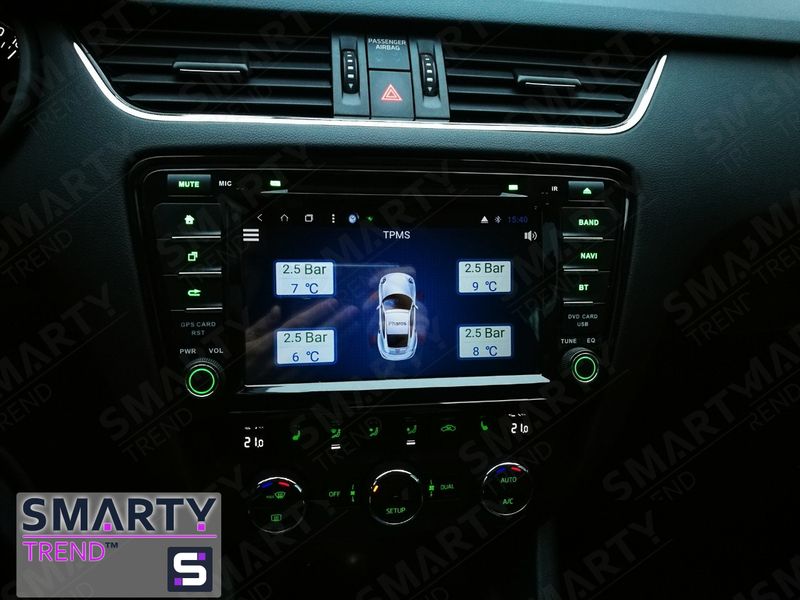 SMARTY Trend head unit overview forSkoda Octavia A7. Car Skoda Octavia A7 is a great budget car. Ideal for a city, inexpensive to maintain, reliable. This is only a small part of the advantages of this car. Thus, since the car cannot be called new, there are certain problems with its improvements. Of course, you can always contact the official representatives of the company Skoda, but as experience shows, the cost of work is unreasonably expensive, the quality leaves much to be desired. The company SMARTY Trend will find the selection of the head unit for your car, taking into account the configuration of the car. We present to your attention, some of those new features that become available in this car! Tire temperature and pressure control system. A very popular feature that is available mainly in cars of recent years of release. The essence of this system is real-time monitoring of temperature and tire pressure using sensors, information is transmitted to a special device that is connected to USB. In cases of changes in one of these indicators, the system will notify you, that is, an alert will appear on the main screen and a sound alert. Ideal for drivers who are a fan of safe driving. For many motorists, radio is one of the main functions, especially in the case of long trips. SMARTY Trend receivers are equipped with a special NXP TEF6686 digital FM receivers, thanks to which you will receive a stable radio signal regardless of your location, as the type of receivers used in premium cars has been correct. It should be noted simplicity in managing, searching and saving your favorite radio stations. SMARTY Trend receivers allow you to view media files of absolutely any format. The head unit works with absolutely any storage media from SD cards to hard drives. Thus, you can watch your favorite movies, TV shows, cartoons at any convenient time. Save your favorite media files and they will always be at your fingertips. As you can see the car interior began to look more modern. In terms of its functionality, namely the support of standard Android functions and capabilities, the SMARTY Trend head unit has significantly improved the functionality of this vehicle. This is an ideal option for those who are looking for the best value for money. The build quality of the radio and the materials used are not inferior to the original radio. The company SMARTY Trend is ready to help you improve your car! 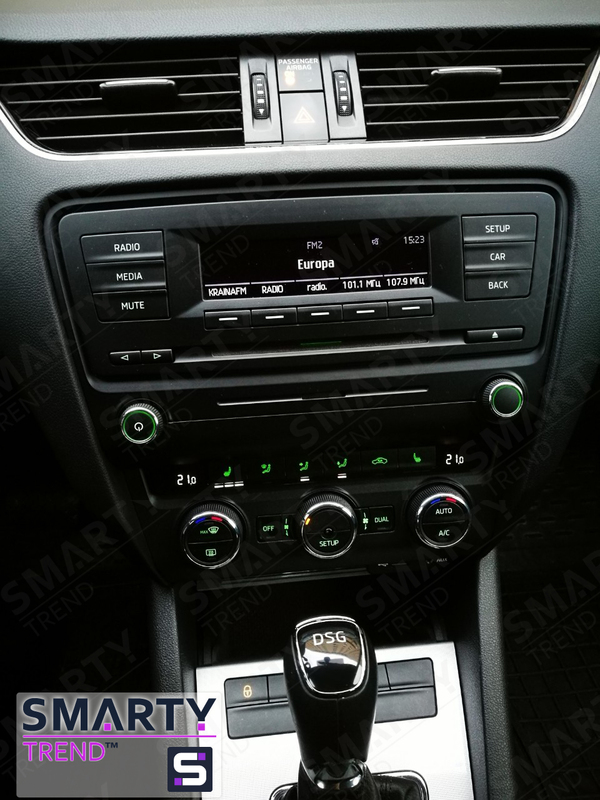 Tag: Smarty Trend, Android head unit, Android, Head Unit, Multimedia, Entertainment, Skoda Octavia A7, Car audio.